The F8F “Bearcat” was Grumman’s last piston engine fighter to conquer the skies. First taking flight in August 1944 and powered by a massive Double Wasp engine, the Bearcat’s performance was superior to many jet powered aircraft of the same era. Over 1,200 Bearcats were produced, operating around the world and participating in conflicts from Korea to Vietnam. The F8F also served from 1946-1948 with the Blue Angels, the US Navy’s premier flight demonstration squadron, and set the foundation for generations of inspiring excellence by Blue Angel pilots. 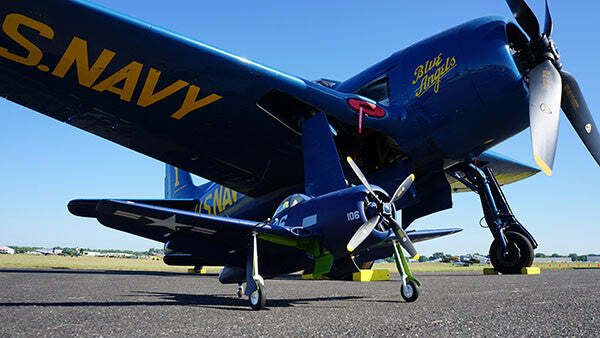 In 2016, FlightLine commemorates the 70th Anniversary of the Blue Angels by presenting this electric flying model to inspire new generations to appreciate the historic F8F Bearcat. 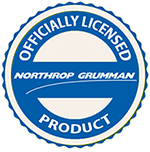 This is the only RC Bearcat that is officially licensed by Northrop Grumman. FlightLine presents an exciting 1/9 scale flying electric replica of the F8F-1 Bearcat. This EPO foam model assembles easily in minutes and features a scale profile with many plastic detail parts such as spring-loaded inner gear doors, highly detailed cowl and radial engine, and removable cannon barrels. The 1200mm wingspan removable wing is easy to transport and strategic carbon reinforcements provide lightweight strength. The Bearcat’s magnetic hatch reveals a large battery compartment that can also accommodate a flight stabilization gyro (sold separately). Cooling airflow is channeled over the battery and ESC compartment. Large flaps help stabilize the aircraft for very slow and controlled landings to accomplish that perfect carrier landing! FlightLine’s F8F-1 Bearcat is a suitable aircraft for novice warbird pilots to advanced pilots. Its 490mm wide landing gear stance provides stable ground handling especially on grass when compared to other aircraft with narrower gear stances or smaller wheels. The power to weight ratio also allows for most any acrobatic maneuver you can imagine, yet the Bearcat’s large wing and flying surfaces are most conducive to stable, scale flight, for an overall relaxing flying experience. Landing under power with full flaps can yield a very short landing length, which is ideal for pilots flying in confined areas. Visit the Official FlightLine F8F-1 Bearcat Discussion Thread on HobbySquawk.com for additional photos, videos, reviews, and customer Q&A. There is an optional two bladed propeller Sport Power System (sold separately) to achieve speeds up to 147kph/87.5mph. This Sport Power System includes: 3648-880kV motor, 12x8 2 blade propeller, and 2 bladed spinner. Click the upgrades tab above for more info. September 11, 2018 - The FlightLine 1200mm F8F Bearcat recommends a 4S 4000 mAh Lipo, but a 4S 5000 or equivalent weight can be used. Special care for CG must be taken with this model. I don't do too many reviews, but this plane has won me over. It's quick enough to still be fun without inducing white knuckles down low. It takes off wonderfully and it's lands almost at a standstill with full flaps, so long run outs trying to fight an under responsive tailwheel on paved runways during landing are almost non existent. Only real complaint are the decals, while very good looking and mat finished once applied they come off very easily and I've had a couple of "oh ****" moments when I thought pieces of the plane were coming off only to find another decal missing upon landing. But that complaint is truly a side note to what has been an overall excellent experience with this plane. So I would say it truly is a "Fantastic" warbird if I may borrow that oft used expression from good old Captain Ryan. Literally! On the first flight, the plane was wildly uncontrollable. It was all I could do to keep it in the air while I was trying to make adjustments to try to keep it from going straight in. In the process, it got out to far to be visible enough to tell which way it was flying. In desperation I cut the power to cause it to go in with the hope of being able to find it or hitting someone or something. Several of us looked for it but could not find it. That is the first plane I have ever lost. It is a beautiful plane and I can see absolutely no reason why I couldn't fly it. I am not discouraged. I have already ordered another. Will update my efforts when the new on comes in and I try again. I got the Bearcat after a fair amount of research, and reading mostly positive reviews. I got the plane and assembled it....some difficulty here. The holes in the control surface horns were a little too small to accommodate the pins on the control rod attachments. After wrecking a couple, I used a needle to enlarge the holes. Not a huge deal, but still a pain. I installed the receiver, connected the control box and tried to finish setup. Binding was no problem, and the control surfaces all worked fine. The landing gear was another story. I was unable to cycle them at all. After talking with Motion RC support, they suspected it was the control box and sent me a new one. I decided to try and remove the control box and use Y cables to see if I could get the gear to work. Still no luck, then I discovered I could get the gear to cycle once if I plugged into the the flap connector (Aux1) I thought I may have a dead gear pin on the receiver, so I swapped it with a receiver from another airplane that I know worked. Still no luck...not sure what else to try. It's a great looking airplane, and I am dying to fly it, but I'm disappointed by all the problems so far. Nice plane from flightline, everything is perfect. only the stickers that need to be glued if you want to keep them in place. I don't understand why, but all of my warbirds needed weight on the nose... the bearcat is not an exception. more than 100g.